I’d set out to scrawl this bike-writing message a couple days ago, but after a terribly wrong turn three letters in, I aborted the mission. Apart from the fact that I was riding in wholly unfamiliar areas, this relatively small bike-writing effort was big on challenges. Steep cobblestone streets that narrowed into deeply potholed dirt lanes. Barking dogs nipping at my shiny new Sidi shoes. Motorcycles darting out of side streets. Intersections without signage. And chickens crossing the road, for whatever reason. The route ends right on the doorstep of Bici Bucerias – the great group of guides I’ve been riding with (and whose bike I’ve been riding on) in and around Bucerias. 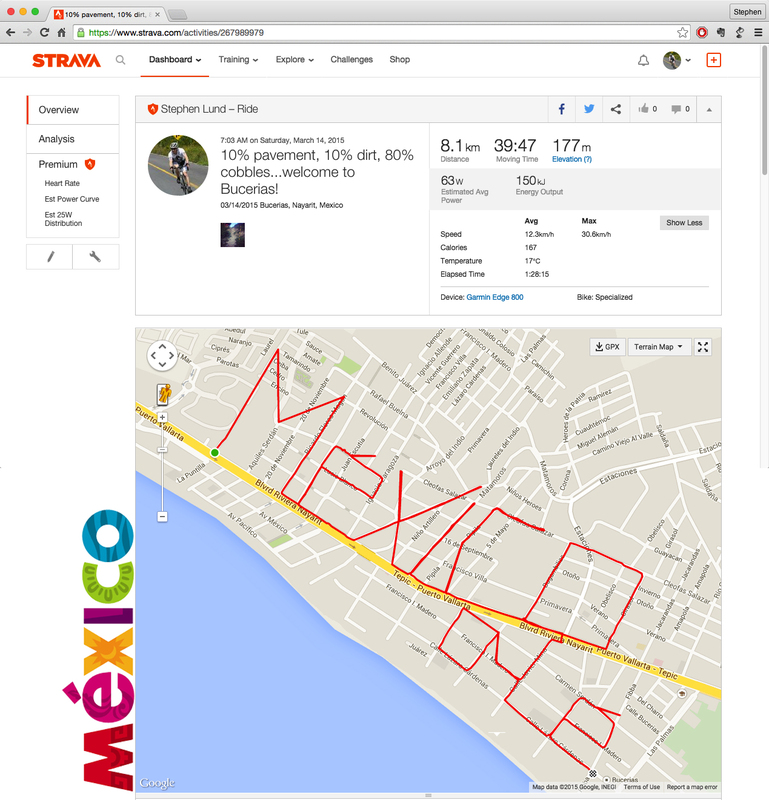 This entry was posted in bike-writing, gps art and tagged bicycle, bicycling, bike-writing, bucerias, cobblestone streets, creativity, cyclist, garmin, gps, gps art, mexico, strava, strava art. Bookmark the permalink.